Top Gun Tours can reveal the Swan Valley’s secrets to you! Do you enjoy spending a day in the beautiful Perth Swan Valley, but find it gets crowded or you are not sure what is worth visiting next? You might not be experiencing all that the Swan Valley food and wine trail has to offer. You might think you know the Swan Valley and all its highlights and destinations, but do you know you can experience it in a completely different way? Allow yourself to be shown some of the Swan Valley’s best-kept secrets by one of its most prestigious operators and knowledgeable tour guides on a Top Gun Tour. Top Gun Tours is prepared with barrels full of information and secrets to share. Only with Top Gun Tours will you be led to pure bliss and indulgence whilst experiencing all that the Valley has to offer. You can book a Swan Valley wine tour with your friends, your partner, your family, for any occasion you like, and let us take care of the rest. You will have absolutely nothing to worry about on the day. From the moment you step on the bus be prepared to be transported to some of the Swan Valley’s finest and most delicious destinations. Top Gun Tours taps into one of the Swan Valley’s best-kept secrets – The Swan Valley Food and Wine Trail. Not many people know that there is an official Food and Wine Trail that can be traced over a 32km loop of the Swan Valley. Of course it would take many trips to the Swan Valley to tick off all 150 destinations on the Trail; however Top Gun Tours can provide you with a true taste of the best. The Swan Valley Food and Wine Trail includes breweries, local restaurants, cafes, distilleries, shops, accommodation, roadside stalls selling delicious local and fresh produce, and of course amazing wineries and stunning vineyards. Top Gun Tours will take you through some of the most popular, some little known but equally as stunning, and some of the most amazing destinations in the Valley without you having to study the map and decide yourself where to go. Doing the journey alone means trying to decipher a map and deciding who will be the designated driver. So let Top Gun Tours take care of the locations, the driving, and the experience so you can let the day rollout before you for a truly indulgent experience. On a Swan Valley wine tour with Top Gun Tours you can experience the best-kept secrets you might not pick out if given the choice yourself. Part of the fun is letting the day take you away. Let Top Gun Tours showcase the Swan Valley like no other tour can. We will take you through popular destinations such as the Sandalford Winery, where you can experience one of the largest selections of wines the Valley has to offer whilst sampling delicious cheeses and snacks. You will follow on to other wineries and destinations, sampling tasty wine, icy cold beer, homemade nougat, roasted nuts, fresh fruits, amazing local cheeses, and mouthwatering meals. You will be taken to another world by the magnitude of amazing fresh and local produce you can experience. On the same tour we can take you to Entopia Winery, where you will meet the Swan Valley’s best-kept secret – the nicest grandparents in the Valley with one of the most delicious and generous wine samplings. Be prepared to be treated like family, set in a picture perfect white gazebo, amongst luscious rolling vines. An experience that truly cannot be missed. It is moments like these that make Top Gun Tours one of the Swan Valley’s finest tour buses. We offer a luxurious bus, with an amazing indulgent experience that will take your taste buds to another world. Be prepared for only the best along the Swan Valley Food and Wine Trail. 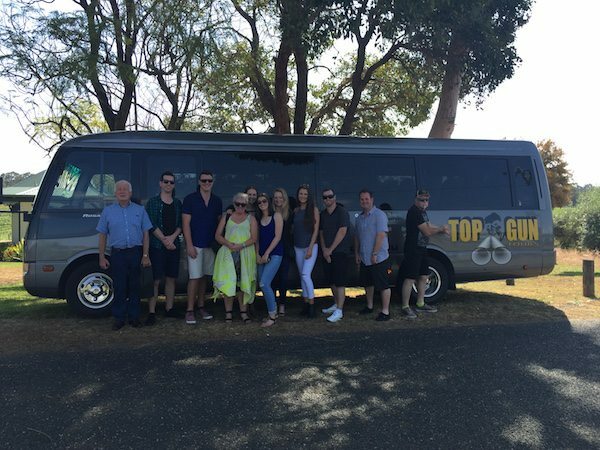 If you would like to book a Swan Valley wine tour, contact Top Gun Tours today and we will be more than happy to help you.